Determining how to run the football is arguably the most important and most challenging thing an offensive football staff does each week during the season. Many coaches are also self scouting and evaluating their plans for spring practice this time of year as they determine how to best use the personnel they have (or don’t have) for this fall. Running the football is a tricky thing because the only good run play is one that your offensive linemen understand how to block against any defensive front they see or at least your quarterback understands how to get you out of a bad look. Some plays are good against every front except for say a 4-3 Under front. Some plays are better if you run them to the left because your right guard will be pulling and not your left. There are running plays that draw up so beautifully when run out of a 3×1 formation but not so much out of a 2×2. We draw up every run play to the left and to the right. We organize our plays by formation and also concepts. We offer coaching points and player assignments with every run play. Until FirstDown PlayBook develops your editing tool we know that we are likely not going to have the run plays all drawn up exactly as you would but man what a powerful resource to quickly go check how someone else blocks that play vs a Bear defense for example. Another practical use is the ability to be able to use this as a scout team resource this spring. This will allow you to quickly and easily have a run period prepared as you plan your spring practices. 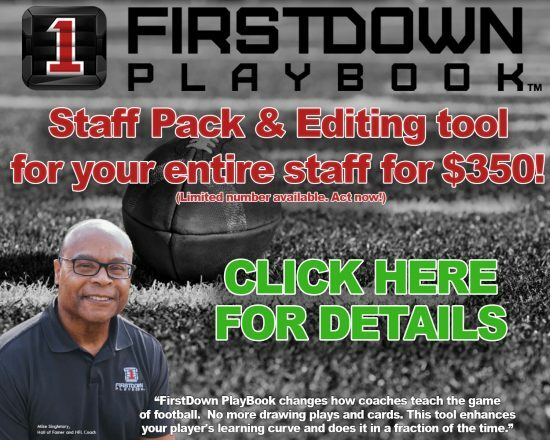 Yes, the number of applications for the FirstDown PlayBook run game section are many and we want to make sure you know how to find it and navigate it once you’re there. That’s why we have created this short video that explains how to use the FirstDown PlayBook run game section.